Ankush has 2 different erasers and 3 pencils. Number of different possible combinations of 1 eraser and 1 pencil is ____. Which of the following options will replace X and Y in the given data? Which of the following is an empty element? is not an empty element. The answer will be D because- It is not mandatory to close the list elements for example you can also write as "<.LI.> 1" or "<.LI.>1"
Answer is D - All of these. Complete the given hierarchy (that shows the examples of utility program), by replacing ‘P’, ‘Q’ and ‘R’. Given here is a snapshot of Record Macro window. 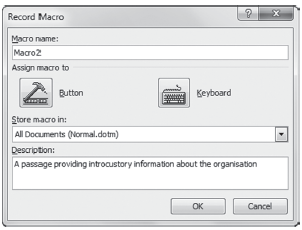 What would happen when you save and run this macro in MS-Word 2010? AThe text typed in Description field will get displayed in Status bar. BThe test typed in description field will get typed in document area. CDescription text will get inserted in Header Area. Find the odd figure out. The correct answer is C.
Which of the following statements is INCORRECT about OCR? AIt is the electronic conversion of images of typewritten or printed text into machine-encoded text. BIt is used in artificial intelligence, computer vision, pattern recognition etc. CIt cannot be used for automatic number plate recognition of vehicles. The OCR stands for Optical Character Recognition. Only the statement in the option C is incorrect as the OCR can be sued for automatic number plate recognition. Hence, the correct answer is C.
Which of the following Shapes Outline medium is applied in the given image of MS -Paint? The answer is (D) as if you see the texture it is same. The given logo is of a/an __________ by Sun Microsystems. The given logo is of an Operating System. Hence, the correct answer is B. Which of the following technologies was used in ENIAC computer?